Mesa County Commissioner Rose Pugliese stands against the backdrop of the Whitewater area, which sits atop an oil-bearing formation that the Bureau of Land Management said be tapped under a master development plan for 108 wells on 12 pads. BLM approval of the plan has long been a goal of the county commission. A plan to drill for oil in the Whitewater Basin can go forward, the Bureau of Land Management said. 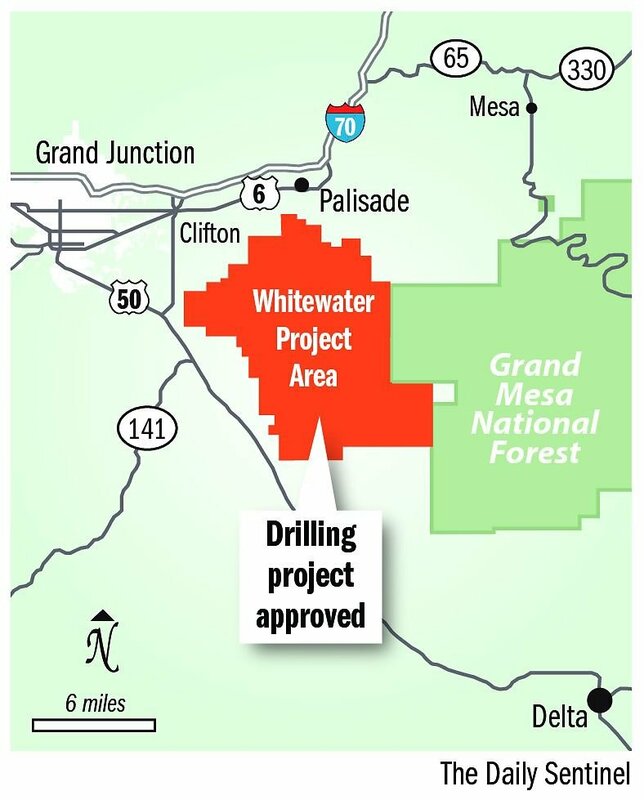 The approval of Fram Operating LLC's Whitewater development plan comes as part of the Trump administration's America First Energy Plan, the BLM said in announcing the decision. For supporters of the project, the BLM's decision was a long-fought victory that goes back to before 2013, when opponents appealed the project to the state office in Lakewood. "We have oil and gas all over Mesa County," said Commissioner Rose Pugliese, whose easternmost commissioner district includes the 26,000-acre project. "This is no different than any activity BLM permits under multiple use." Construction and year-round production will provide about 70 jobs over the anticipated 20-year life of the project, the BLM said. Fram officials didn't immediately respond to requests for comment. "I'm happy for Fram and I'm happy for us as a community," said Diane Schwenke, president and chief executive officer of the Grand Junction Area Chamber of Commerce. "We're going to see real economic impact from something other than natural gas, which has been our total focus." Opponents, however said they fear the effects on water and air quality. "I can tell you we're not thrilled," said Emily Hornback, interim executive director of the Western Colorado Congress. "The concerns we keep bringing up have not been addressed." The congress is considering its options, which include an appeal to the state BLM director, the Interior Board of Land Appeals and possibly the courts. The BLM had previously approved Fram's plans, but action on the plan has been delayed since 2013 when opponents said the plan failed to adequately take into account the effects of hydraulic fracturing on water and air. "I think this was one of the first things on the agenda in '13 when I became commissioner," Mesa County Commission Chairman John Justman said, noting that the new jobs will be welcome in a local economy just starting to feel the stirring of growth in the energy sector. County coffers also stand to benefit from taxes the development will generate, Justman said. "This project has been kept at bay" for political reasons, said David Ludlam, executive director of the West Slope Colorado Oil and Gas Association. "It could have been approved five years ago if there had been the political will. I look on it as a cautionary tale about how influential government can be on the ability to conduct business in America." Rancher Don Lumbardy's property adjoins one of the 12 pad sites from which the 108 oil wells will be drilled. Officials have acknowledged that drilling might affect the water on which he and his livestock depend, Lumbardy said. He's been told that federal officials "can't say for sure" that his water will be unaffected, Lumbardy said. "That tells me they don't consider water important enough to be worried about," Lumbardy said. After opponents appealed the project in 2013, the state office said local officials would have to reconsider the project in light of the need for hydraulic fracturing, or "fracking," to take place. BLM Grand Junction Field Manager Katie Stevens said the project will protect resources while making it possible for Fram to move ahead. "Facilitating energy development in the area is a win for the local economy," Stevens said. The project includes many protections for area resources, including wildlife, air and water, Stevens said. With approval of the plan, the BLM is now waiting for Fram to submit applications for permits to drill the wells, which will begin the next phase of the process. The Colorado River Valley BLM field office has been designated to handle oil and gas related issues, including the Fram project. "I know for a fact that the people in the Colorado River Valley Field Office have worked hard on this under both administrations," Ludlam said, referring to the Obama and Trump administrations. "I know firsthand they've worked hard on (the plan)."